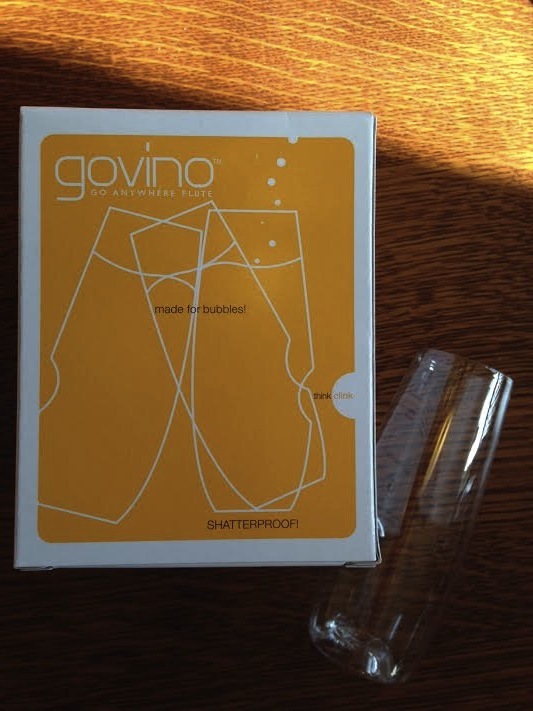 Govino Go Anywhere Champagne Flutes: ($12.95) This is a set of four disposable champagne flutes from Govino. While I understand why some people weren’t happy with them being plastic and disposable, I think we will get use out of them, but I think it will be during the summer. 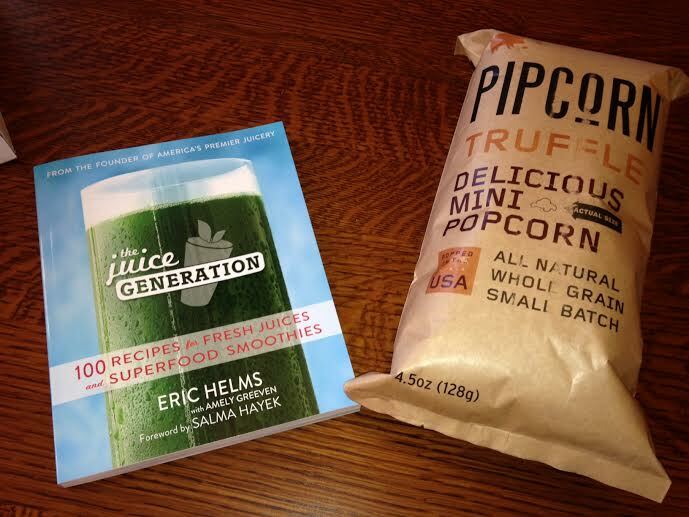 We take picnics to jazz in the park a lot of summer Sundays, and these are perfect. I can’t really see using them more than once like they say you can, but we shall see. 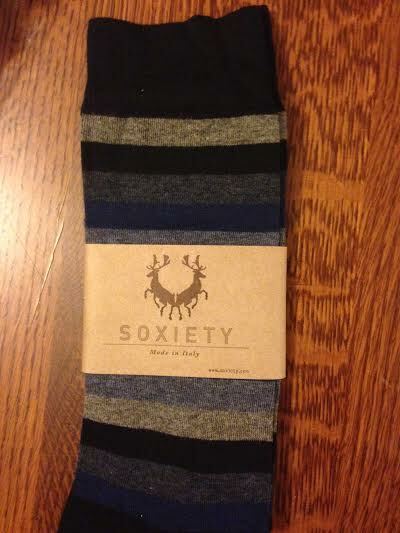 I didn’t think these were amazing, but we will use them. 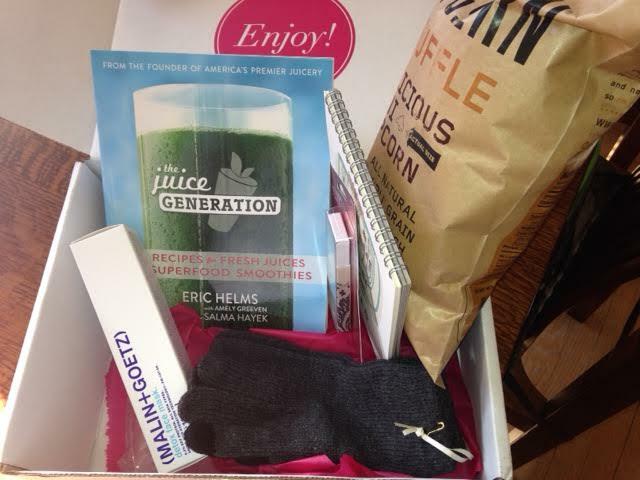 Whoa, snack-city for this PopSugar box. 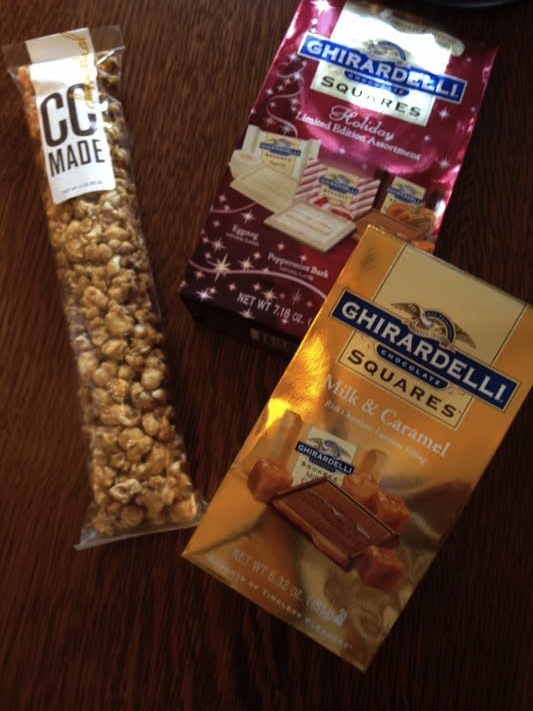 CC Made Caramel Corn: This is a great size to add to a gift basket, which is probably what I will do with it. After the peppermint pretzel incident from the Special Edition Box, I need to lay off the snacks for a bit. Ghiradelli Squares: (2 packs) ($4.25 each) These were fine, and I actually put them out at our cocktail party, so I got use out of them right away. The Pumpkin Spice flavor is to die for. These were listed on the information card as an extra, although I thought it was a little weird that there were two packages of them. Chocolate is good, and so I accept these and will do my best to give most of them away. 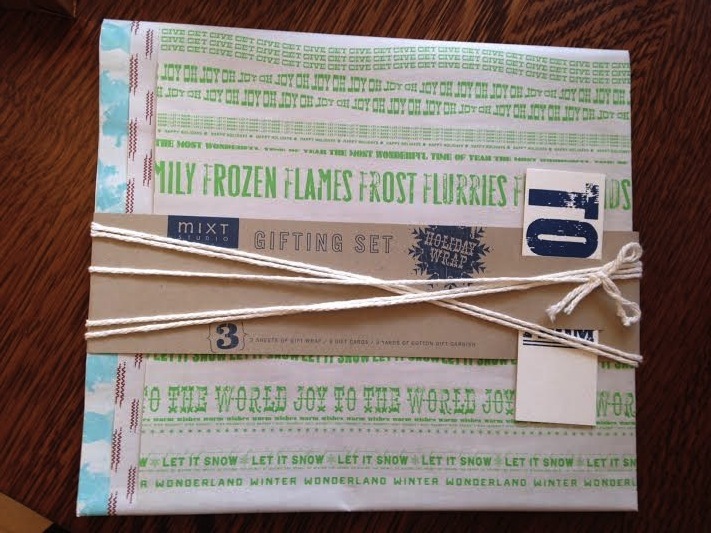 Mixt Studio Holiday Gifting Set: ($9) This is a package of three different kinds of wrapping paper with string and tags to finish the packages. I think this is super handy and pretty, and I will be wrapping a few presents with it this week. i thought this was a cool addition for the holidays. 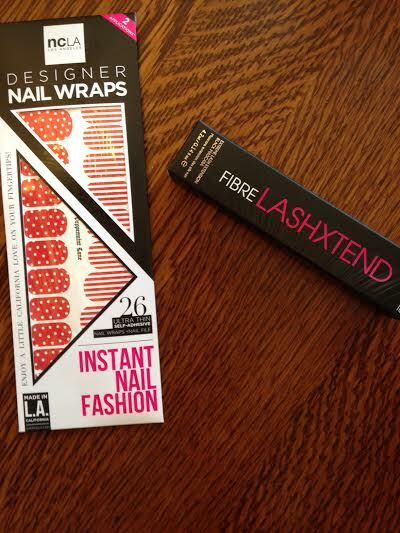 NCLA Peppermint Lane Nail Wraps: ($16) Nail wraps are not my thing, but I already know who is getting these as a gift. We are doing a small-gift gift exchange with my husband’s family, and I am going to put together a little nail set for Mike’s brother’s girlfriend. These will be perfect to add to that. Modelco Fibre Lashxtend Black Mascara: ($20) I have a ton of mascara, and as I have mentioned a million times, am currently totally hooked on It’s So Big mascara by Elizabeth Mott. 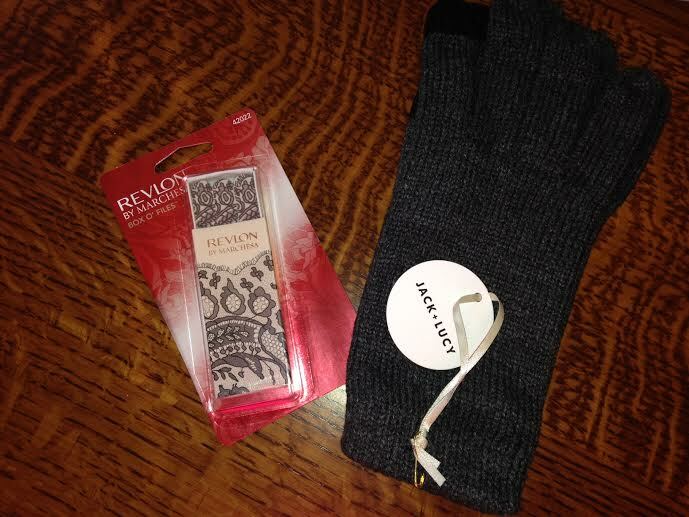 This will go in the makeup box for gifting or putting into the Bag-o-Beauty for girls’ trip. I’m sure those classy ladies will throw down to see who gets a full size mascara out of there. 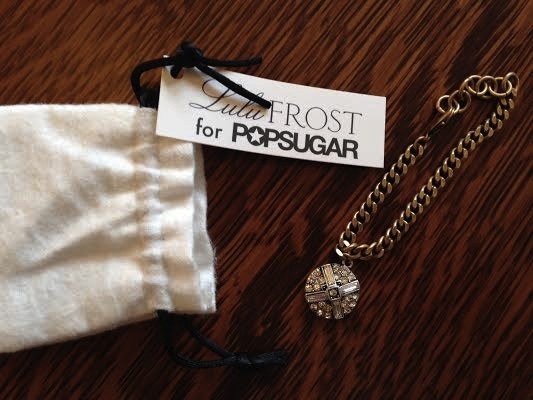 Lulu Frost for PopSugar bracelet: ($110) This was another item in the box that had a lot of mixed reviews. I really like it and will wear it. 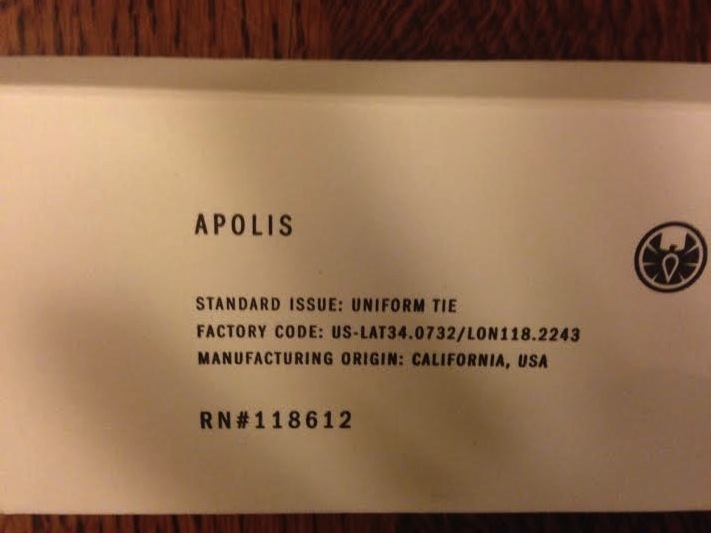 While I would not pay $110 for it retail, I think it is edgy and pretty at the same time and am excited to wear it. Lulu Frost items are typically pretty spendy, so I think that is part of what they figure into the price. I like that it is a special edition for PopSugar, and I like the antique coloring to the gold chain. This was my favorite thing in the box. 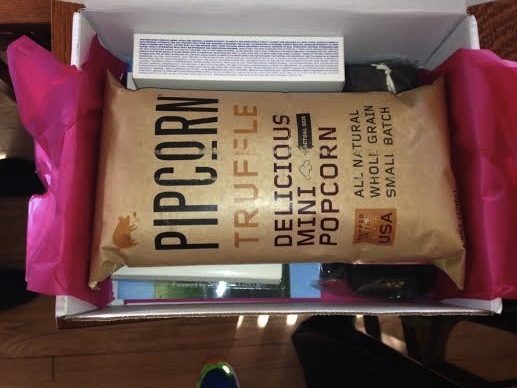 All told, this PopSugar Must Have box had a value of around $180 for the $39.95 pricetag. 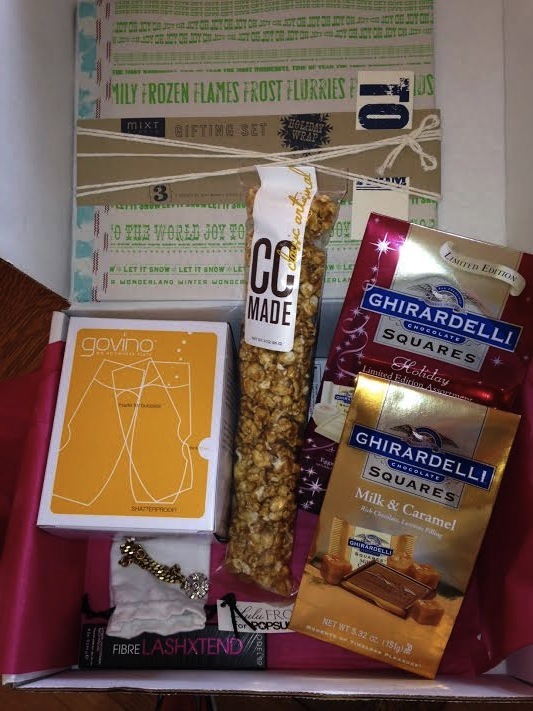 I liked the holiday cheer, loved the bracelet, and thought it was pretty good, though not my favorite PopSugar box. Looking forward to what they have in store for 2014. 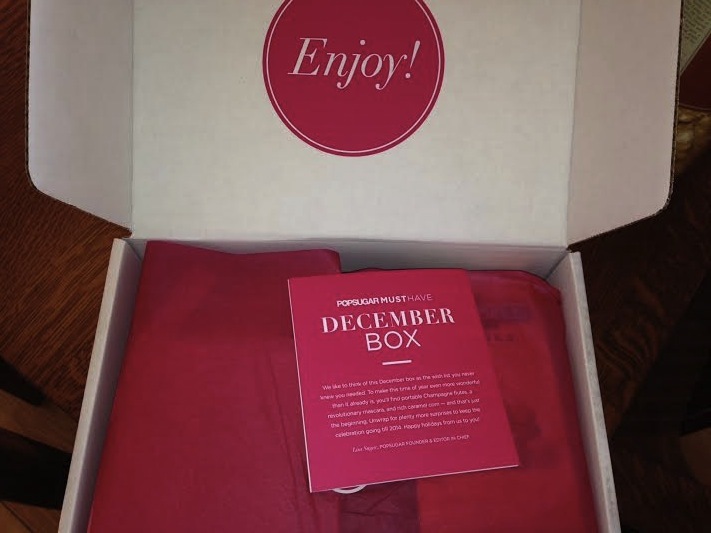 You can always get $5 off of your first PopSugar Box by using the promo code REFER5. Mark and Graham Everyday Leather Travel Pouch: ($79) My husband is already pretty into his Blue Claw dopp kit from last month’s Bespoke Post, but this one is really nice, too. It is quite small, although, when I think of travel bags, I think of all the crap I lug with me, and my husband, like most men, does not need that much. So this size might just be perfect. 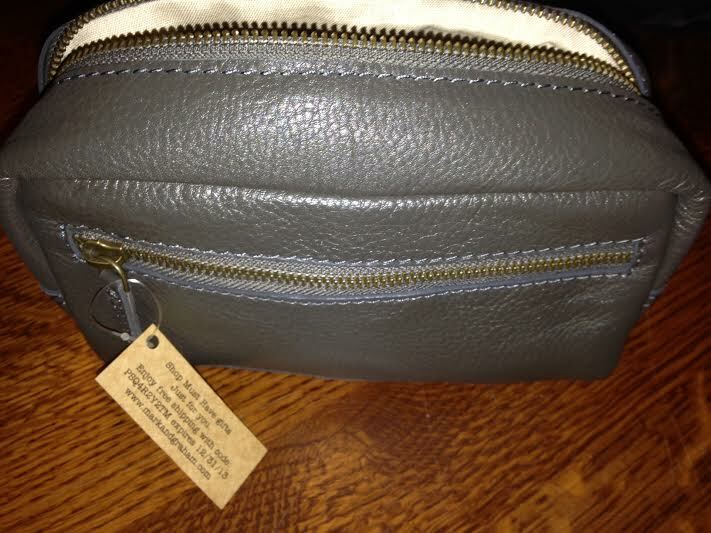 This is a really nice, buttery leather and would also make a great gift. 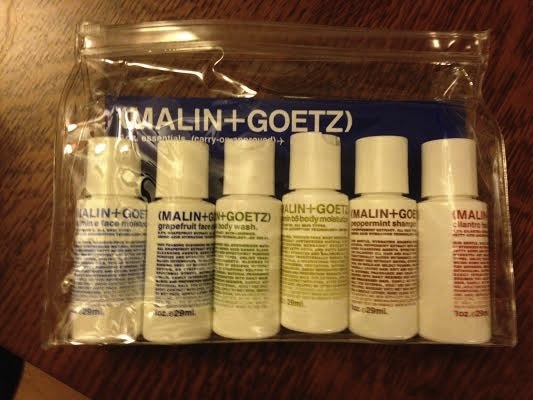 Malin and Goetz 1 oz Essential Kit: ($30) I am super jealous of this. I so wish this was full of stuff for the ladies, but instead, it is all very manly and yummy. 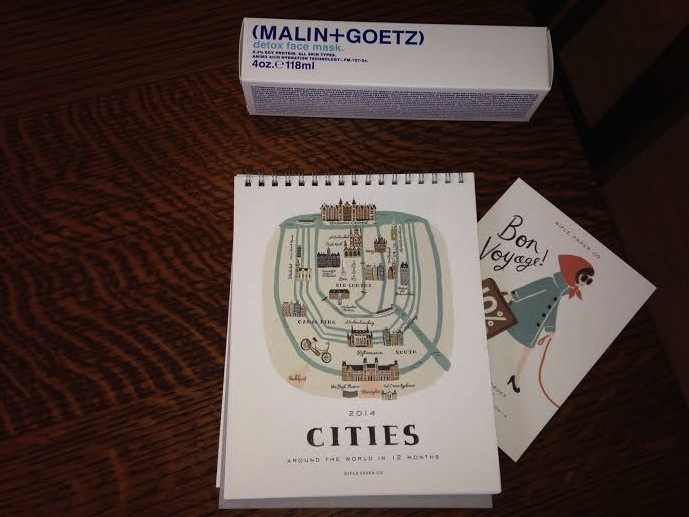 I think my husband will like this a lot, as he travels on and off quite a bit. Whatever is convenient to get him through security faster is a win with him, plus, there would be room in here to add his cologne and just go. He is fine using hotel stuff, but I always hoard that stuff to donate to the women’s shelter, so maybe this will change his mind about that. 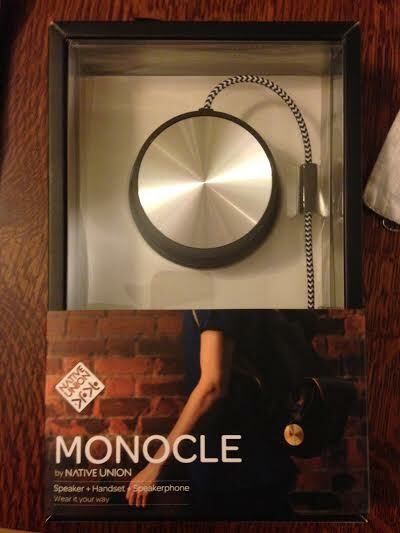 Native Union Monocle: ($59.99) Ok, so at first I was wondering whether my husband would use this or not, but now, I really think he will. We have hands-free BlueTooth in our newer car, and it has been life-changing, but he actually drives our older car most of the time and has lamented that he hates holding his phone while driving because after using the hands-free system, he realizes how dangerous it is. Since we are still 10 months away from replacing that car, I think this might just solve his problem. 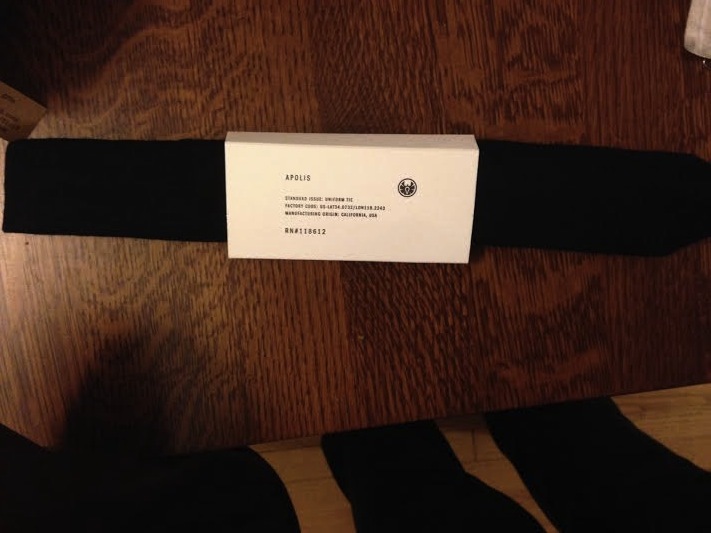 He also might use it at his desk, where he listens to music very quietly most of the day. I think he is really going to like this one. Chip-Zel-Pop: ($3.50) Oh, holy cow. This dangerous stuff is right in my wheelhouse, as I am a sucker for all salty-sweet things. I am going to make Mike take this to work, or we are going to put it out for the party on Saturday, but it cannot get opened in this house unless it is for a crowd, otherwise I will have to spend the rest of December at the gym. And I have plans to do other things. This is a mix of potato chips, caramel corn, pretzels and chocolate. Yeeeesh. 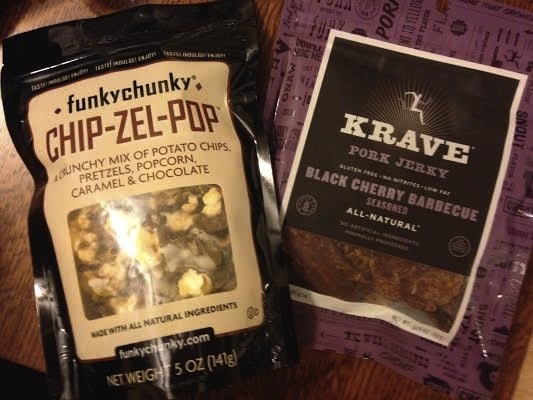 Krave Pork Jerky in Black Cherry BBQ: ($7.00) We usually only do jerky when we are backpacking, but I know my husband loves it, so I’m sure he will bust into this as soon as he sees it. It looks really good, and the flavor sounds awesome. 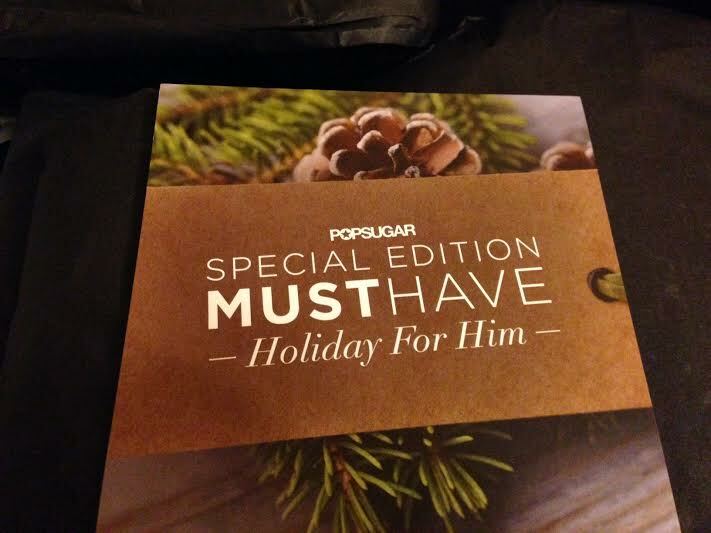 All told, the PopSugar Special Edition Must Have Holiday For Him box (now sold out) had a value of over $250 for the $100 price tag. I think everything in this box was well-curated and that my husband will use almost all of it, and what is left will make very nice gifts. Way to go, PopSugar. 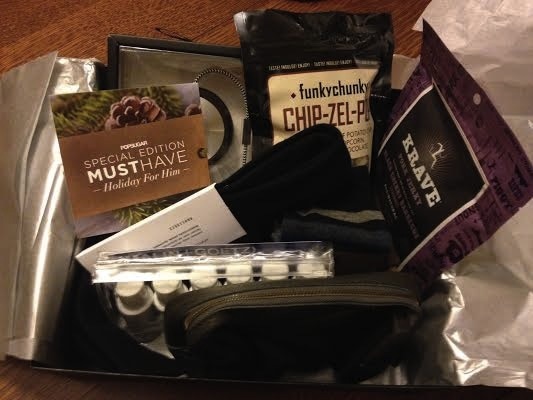 This men’s box rocks.